The day before Christmas, late in the afternoon, an HR company receptionist knocks on the manager’s door and tells him that there’s a reindeer with a resume in the waiting room. Thinking it’s a novel Noel gag, the manager laughs—but, clearly uneasy, she doesn’t. Incredulous, he takes a peek, and, sure enough, there’s a full-sized heavily-antlered reindeer bedecked with ribbons of bells tapping and cooling his hooves while looking over his resume. It’s been a slow day, so the manager makes time for this; besides, it’s a talking reindeer. Settled in his office, the two of them get down to business. 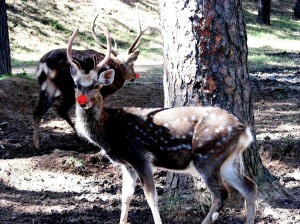 Name: Rudolph. Position sought: full-time team leadership role. Most recent position: Lead reindeer. Current employer: the Kris Kringle Foundation, a non-profit global charity. Current contract: recurrent seasonal, since 1939. Rudolph: “Not really. Whatever toll a delivery-system‘s ‘substitution effect’ takes on their sales, it is more than offset by the transport, distribution and delivery volumes our organizational mission generates for them. For example, KKF benefits FedEx, UPS and the U.S. Postal Service much more than we cost them through our competing-complementary distribution-delivery system.